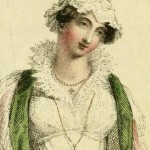 Regency Best Dressed List ~ What would you wear? Kristi here. 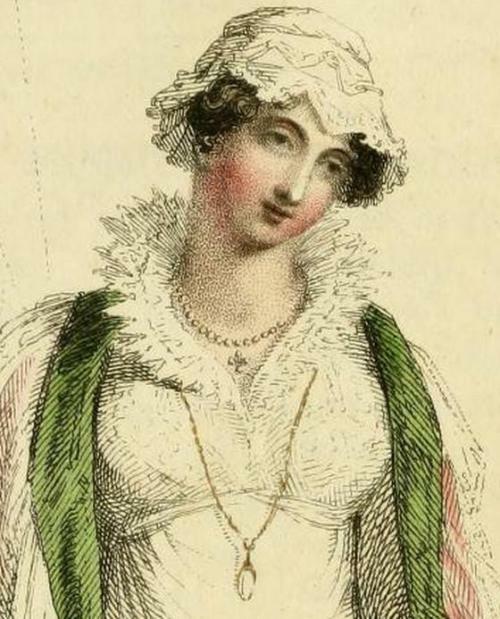 It’s no secret that part of the Regency era’s appeal is the clothes. Fancy and glamorous, yet relatable with it’s lack of hoop skirts and horse hair bustles. I’m going to the ACFW (American Christian Fiction Writers) Conference in September and one of the events is a dinner where everyone is invited to dress up as one of their characters. I don’t have a Regency era dress. I’m seriously considering making one (with the help of my considerably more sewing skilled mother). If I do it will probably be a fairly simple cotton one, not a fancy ballgown. 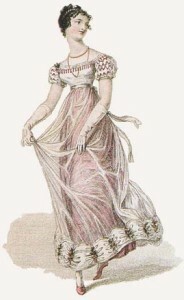 But if I were to dream, what kind of Regency dress would I want? First off, it would definitely be an evening dress. The ruffles around the neck and face that often accompany morning dresses would drive me insane. Second, I’d want some color. I have no desire to look like a ghost walking around in an all white gown. I’d stay away from the lavenders and purples, since those indicated a state of half-mourning. Red would be a bit garish, though the Hubs always likes me in it. I think I’d lean to the blues or greens. I see more blue in Ackerman’s prints than green, so we’ll go with blue. I think my favorite would be something like this, but with a blue underskirt instead of the pink. And guess what? 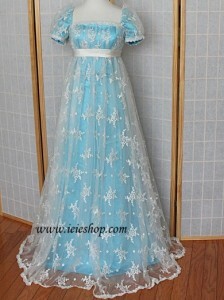 I could actually order a reproduction dress very similar to it… though of course it’s rather expensive. It’s gorgeous though, isn’t it? Of course, this was all dreamed up before I came across this beauty. 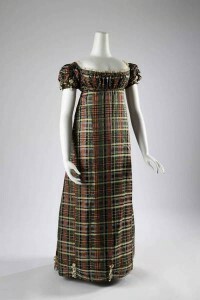 One day I’m going to have to write a heroine with the gumption to walk into a ball wearing a plaid evening gown. That is just amazing. What about you? Do you have a dream Regency outfit? The Romance Writers of America had their annual awards ceremony this past weekend. Inspirational Regencies were well-represented when our very own Kristi Ann Hunter won the Golden Heart award for unpublished Inspirational manuscripts. You can check out the other winners, including the Rita for best published Inspirational romance at the RWA website. Here a Book, There a Book, Everywhere a new Book! 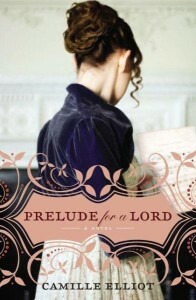 In addition to her anticipated Regency (coming out in August! ), Camy Tang just released a contemporary romantic suspense in an anthology titled Sealed With a Kiss. She’s also busy working on two series for next year: a romantic suspense and a regency set. Speaking of August releases, keep an eye out for Vanessa Riley’s new Regency tale: Swept Away. Ruth Axtell has stepped a few years past our beloved Regency to delve into the equally stunning Victorian world. Her novelette, Victorian Spring, is available now and the start to a fabulous new series. Friend of the blog, Kristy Cambron released the first book in her WWII series. The second one comes out in April. In addition to sending books out through her agent the hopefully-soon-to-be-published Susan Karsten is super busy. A son getting married, two girls headed off to college, and a 25th anniversary to celebrate make for a full and wonderful life! Laurie Alice Eakes recently returned from the RWA conference. What about you? We’d love to know what’s going on in your life! As an American, reading books set in England – particularly historical England – could sometimes be confusing. Once I started researching the time period, I realized that certain words had different meanings “across the pond”. So for everyone like me, I’ve put together a list of a few things that used to confuse me. Hope they help! Hall is one of those words that seems simple, but has vastly different meanings on each side of the Atlantic. I always wondered why people spent so much time standing around in the hall. Wasn’t it cramped? Because in America a “hall” is a passageway – usually on the narrow side – that rooms open off of. In Regency England the hall was the area the front door opened into. Similar to an American foyer or vestibule. In large English homes, the hall is a room in an of itself, often a fairly large one since visitors were sometimes required to wait there a while before being admitted further into the house. In Jane Austen’s Pride and Prejudice, Jane Bennet mentions that her aunt and uncle live in Grace Church Street. In American English, that implies Grace Church Street is neighborhood or even an apartment building or some other such collection of living spaces. What is actually means is that her aunt and uncle have a house with a Grace Church Street address. In America we would say they live on Grace Church Street. It’s a distinction that some modern day Regency authors use and others don’t, but now you won’t be confused if you ever come across it. It’s just that: your home in town. When Americans normally think of as being townhomes are actually called terrace houses in England. These are houses that share a wall with another house on one or both sides. Many homes in Mayfair are terrace houses, but not all. So when the heroine heads to her townhome for the season, she’d probably sharing a wall with her neighbor, but not necessarily so. Have you ever seen characters going up to the first floor? Or looking down from a first floor window? For an American that can be quite confusing – to the point that I try to avoid saying which floor they’re on at all. The “first floor” in America is actually the “ground floor” in England. So people had to actually go up stairs to reach the first floor. What other terms do you find yourself stumbling over? Any other words you’ve found have a double meaning? What are your favorite Regency romance plots? Hi guys, Camy here! I was talking with a friend of mine who also loves Regency romances and we were discussing our favorite Regency plot types. I am embarrassingly fond of “secret baby” plot lines as well as “marriage of convenience” (which I just this moment remembered is in Prelude for a Lord—I am nothing if not predictable). My friend loves “friends discover they love each other” plot lines, and she also favors strong female lead characters. So it got me wondering, what do other Regency lovers prefer? So please weigh in! I am super curious to know what types of story lines you prefer in your Regency romances. I’m including a list I got off the internet to jog your memory, and I have to admit some of these gave me a chuckle while others made me nostalgic for some of my favorite Regency books. If you think of any other types of romance plots that aren’t listed here, please do mention it in the comments! How do you picture your Regency characters flitting about London by night? 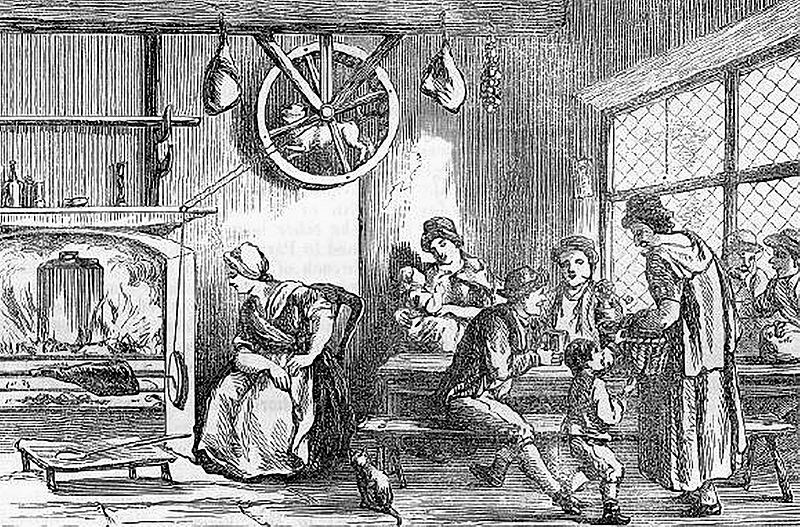 Until 1807, London went about by the feeble flicker of oil lamps. Special interest groups fought against gaslight, fearing the loss of the whale-oil trade. The inflammatory Bill of 1816 (supportive of gas lighting) would also ruin the navy, the ropemakers, sailmakers, etc. etc. according to its opponents. Yet gaslight did more for prevention of crime “than the days of Alfred the Great”. Lighting at night brought safety, but also enhanced the reputation of London as the City of Sin. “London Lights” was a slang term referring to the regency age’s gilded immorality. Nightlife entertainments in London were hideously vulgar, and respectable citizens did not take their families out after dark to public venues. My source says the “flaring gaslight” was appropriate to the rough and tumble array of available diversions. What do you picture for lighting when you are reading or writing regency fiction? Please leave a comment. I discovered the most delightful regency romance the other day on Amazon. 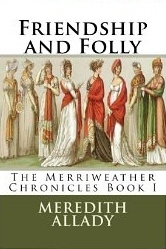 Friendship and Folly by Meredith Allady, Book 1 of the Merriweather Chronicles. Something that intrigued me from the first was the introduction, where the author explains how she found this manuscript in an old trunk of her grandmother’s, a trunk filled with old journals and manuscripts. She edited the most complete manuscript and has published it as “Friendship and Folly by Meredith Allady.” Whether Meredith Allady is her real name, her grandmother’s, or a pseudonym–or pun (Meredith, A Lady?) matters not. What I discovered when I began reading it is a wonderful story told in what I found is an extremely authentic Regency-style, which I why I think it truly is a discovery from someone’s old trunk and not a well-researched historical. There are allusions to historical events and things only someone who lived in the era (and those of us who have done a lot of regency-era research ourselves) are privy to. The Christian-spiritual thread through the novel is also in keeping with someone writing from that era, very much like Jane Austen. People pray and quote Scripture in a very natural way. It shows how Bible-illiterate our generation has become. The most moving scene happens during the crisis/climax and is very much a Christian lesson. The story also has the wit of Jane Austen. I for one was caught up from page one of this regency story and am glad to see that there is a Book 2 in the Merriweather Chronicles. Read Part 1 of Love Everlasting here. Watching pain, bitterness, and despair wash across Arabella’s beautiful face, Gareth thought the musket ball that had plowed into his left leg at Salamanca was no more than the prick of a pin in comparison with the blow of her words. Her father had gone to Newgate Prison. Gareth hadn’t known that until he returned from Spain. Lord Barr had been transported to New South Wales, a felon never to return to England, stripped of his title, for all practical purposes, stripped of his lands to pay back the Crown, and not one person had come to his innocent daughter’s aid, especially not the man who should have been there to pick up the pieces of her life and fit them together. “There are no excuses good enough to explain away your behavior.” She clutched the back of a chair, and for a moment, Gareth thought she might throw it at him. Instead, she swayed, her face whitening. “Perhaps she should lie down in the other room,” Mrs. Polglaze spoke from the corner. “I’m all right.” Arabella’s voice, so strong in condemning him a moment earlier, had grown wispy. “I smelled bacon is all. And pastry. . . She bowed her head and a flush rose in her cheeks. The fineness of the bones beneath his hands struck understanding into Gareth’s head. Delicate, bird-like bones with no flesh upon them. She was too thin. She was faint because she was hungry. She was hungry because she didn’t have employment and now her purse had been taken with likely the last of her worldly wealth. “I’m a slow-top.” He released Arabella and strode to the door. He couldn’t expect her to listen to him on an empty stomach. Jesus had fed the multitudes before he preached to them. Gareth should have taken that as a model of behavior and offered Arabella food first. He should have taken the Lord as his model for all behavior a long time ago and spared Arabella and himself a great deal of pain and suffering. Arabella had seated herself at the table. She didn’t so much as glance at him. Curls loosened from her chignon spilled around her face, masking her expression. Only the whiteness of her knuckles on fingers gripping the edge of the table betrayed her emotion—betrayed her humiliation, if he knew his Arabella. Not his Arabella. He had lost her years ago because of his own stupidity and pride. All he wanted now was for her to let him help her. No, that wasn’t all he wanted; it was all he hoped to receive to ease his guilt. More no man could expect with the past that lay between them. Arabella said nothing. Mrs. Polglaze took knitting out of an embroidered bag and began to click away at a stocking. Arabella’s hands slipped from the table edge to her lap, one coming up every few moments to brush curls from her cheeks only to have them tumble back again. Gareth paced between window overlooking the stable yard below, to the door. Outside both, noise rose and fell like waves upon the rocky shores of Cornwall—waves during a storm. Men shouted. Doors banged. Carriage wheels rumbled over cobblestones. And, at last, the knock sounded on the parlor’s portal, soon followed by the arrival of two inn servants carrying trays of coffee, cream, and sugar, a pitcher of lemonade, and platters of bread, meats, cheeses, and apples. In her corner, Mrs. Polglaze shot to her feet and bustled forward to serve the meal. She, too, must have noticed Arabella’s hungry look, for the kindly housekeeper piled Arabella’s plate high and ladled a quantity of thick soup into a bowl. “Eat slowly,” Mrs. Polglaze cautioned. “Yes, ma’am.” Arabella began with the white soup, sipping from her spoon with her eyes closed, as though she analyzed the contents of the food. “Beef for the broth, not veal, as it should be. Cheese-paring ways.” She spoke in a murmur, addressing no one in particular. She once confided in him that her father left her with servants while he took long journeys—out of the country—smuggling trips they all discovered too late to avert disaster. The chill of her voice belied the warmth of the late spring day, sending a shiver up his spine and freezing his tongue. His carefully planned speech fled from his head, and all he could think to say was, I never ceased loving you. But he couldn’t say that. She wouldn’t believe that when he told her of the past three years. She certainly wouldn’t believe it now. “I want to offer you a home.” The end of his prepared speech came out first. The words were the wrong ones. For a moment, as she stilled in the act of raising her cup to her lips, Gareth feared she would toss the contents across the table and into his face such an expression of outrage twisted her features. “I am waiting.” Her voice was low, rasping. “I thought as much.” Her voice sounded scratchy, as though she had been talking for hours. She blinked several times in rapid succession, took a long breath, then rose and pushed in her chair. “Can I not?” She glided to the door. Despite her shabby gown and cloak, her stride held both vigor and grace. “Of course, Sir.” She proceeded to empty the contents of her knitting bag and began to wrap the meats and cheese in serviettes. “Then what will you do? Where will you go?” Gareth’s hand shook on the handle. “Anything but housekeeper?” She shot Mrs. Polglaze a smile. “A scullion still has pride.” She gripped the banister and charged down the steps and out the door of the inn. He had always loved her fierce pride, her determination to get her own way. But a lady of good birth, wealth, and fine looks could afford her pride. All Arabella still possessed was her fine looks and a desire to keep her dignity and her pride in tact. Even eating a bowl of soup he provided had humiliated her. Under her current circumstances, her pride was likely to kill her. She flinched, but kept walking. To words of encouragement and wishes for good fortune on his endeavor, Gareth wound his way around those blocking his way until he reached the inn yard, where Arabella was about to step into the area set aside for those seeking work. When she turned, she caught sight of him and swerved to duck behind the stables. Gareth caught up with her on a lane leading to the harbor, where white-capped swells told of a storm out to sea despite the clarity of the sky over the land. “You chose your commission.” The words spilled from her lips like the cry of a wounded gull, like a sword through his heart. “You were wrong. No one wanted me near them.” Her eyes grew luminous with tears. “You received them back?” She sounded surprised. “I dared not leave any forwarding address with the Crown taking everything we owned. I thought they might commandeer the few things that were mine by my mother’s will and leave me with even less until I found work.” She removed her hand from his arm, tucked her hands inside the folds of her cloak, and recommenced walking toward the sea, her head bowed. They had reached the top of a flight of boat steps and stopped with the green harbor water sloshing just below their feet. Gareth rested his hands on her shoulders and turned her to face him. “I promised you love everlasting, and I broke that promise. I put you second when you needed me first. You have no reason to believe that I love you, but I do. I’ve spent months seeking you out to tell you this, to ask you to forgive me, to let us begin a future. . . Now I’ve said my piece. The rest is up to you. If you simply need work, come find me in the inn. Or return to the fair and keep your pride in tact, and I will never come near you again.” He kissed her brow, then walked away from her. Feeling as though an anchor chain were trying to drag him back to her with every step, he didn’t look back. He had to let her go with a choice this time. If she vanished from his life again, he would move on, run is estate and leave it to his older brother’s younger son so he wouldn’t have to choose between his military career and his heart. Every step of the way, he ached to hear the sound of running feet behind him, the sound of her calling his name. But nothing happened. The crowds thickened. The hiring fair and inn hove into view. Like an old man with rheumatism, he climbed the steps to his private rooms, nodded to Mrs. Polglaze knitting in the corner, then stood at the window to watch. After a quarter hour, he saw her climbing from the harbor and entering the fair. An hour after that, she left with a woman in housekeeper black and a gaggle of other young women. Someone had hired her. She would have shelter and food at the least. “Yes, sir.” Mrs. Polglaze packed up her knitting in the bag from which she had removed the food no one wanted. A word to an inn servant had his gig brought around to the front, and they headed back to the small but prosperous estate his uncle had left to him. The sun hadn’t yet set as they pulled into the stable yard at Polhenny. Sunlight turned the ornamental lake to molten bronze, and a peacock added it’s color to the shore and green lawn. Arabella would love this land, the beauty, the peace, the house large enough for a family, but not big enough to be ostentatious. She would have scandalized the servants by demanding she cook meals from time to time, but won them over with her appreciation of their skills. . .
An ache in his heart he had bourne for three years and doubted he would ever be rid of, Gareth headed for the house. At first, he thought he imagined the woman perched on the top step of the portico. Then she rose so she stood eye to eye with him from her elevated position. He waited, heart pounding so loudly he wasn’t certain he would hear it when she asked. “Oh, Gareth.” Her lower lip quivered. He kissed her before she formed a threat, for she had no need to worry he would ever let her go. Let all bitterness, and wrath, and anger, and clamor, and evil speaking, be put away from you, with all malice: And be ye kind one to another, tenderhearted, forgiving one another, even as God for Christ’s sake hath forgiven you. The last place Arabella Barr expected to encounter Major Gareth Reynard was at a Falmouth hiring fair. Three years ago, she would have rejoiced to see his tall, lithe figure striding toward her through a throng, but not there. Not while carrying the tools of her trade along with dozens of other hopeful men and women in need of work, parading past what were mostly the butlers and housekeepers of ladies and gentlemen in need of servants. Yet there she stood, a wooden spoon and a copper pot gleaming in her hand, a mere shade or two brighter than her own ruddy locks. And there he strolled, a glass of lemonade in his hand, and a stout, middle-aged woman in black gown and frilled white cap at his side. Arabella saw him too late to escape, even if eluding his notice were an option. She could not get hired if she ducked behind the copper pan, or the woman beside her, who was twice her width and half a head taller. And she needed someone to hire her. She had spent nearly every farthing she possessed to remove herself to this remote corner of England in an effort to avoid persons who once called her friend or, at the least, social equal. No employment by the end of the fair meant no roof over her head that night and precious little to eat. So why, oh, why, was he in Cornwall instead of with his regiment in Belgium with half the ton? Why oh why had she not fled somewhere like the Hebrides to find work away from the peers who now shunned her as though she would contaminate them with a mere glimpse of her? The answer to her decision was simple—a Scots household that could afford a cook would not hire an English one. The reason for Major Reynard’s presence at the Falmouth hiring fair baffled Arabella into immobility of body and thought, as he drew close enough to speak to her. Apparently paralyzed from the ability to emit speech, Arabella’s mouth remained closed. Not a word formed in her head to move to her tongue, even if those words could force their way past her lips. “I am not your dear, or have you forgotten that you jilted me three years ago?” She spun on her broken-down heel and stalked through the crowd to another corner of the grounds. From the corner of her eye, she watched him bend his head toward the housekeeper as though speaking earnestly, confidentially. Arabella could only guess at the words, as she could see neither Major Reynard’s nor the housekeeper’s faces, nor hear their voices above the tumult of cries of, “Will you pay for this,” from maids wielding dust mops, and “Hot pies. Get your hot pies here,” from piemen carrying their trays above their heads. A-ha! The ring. He wanted the ring back. No doubt he had found another heiress to bestow the betrothal band upon and couldn’t afford to buy another such bauble on a major’s pay. Arabella raised her left hand to examine the bare finger. She had sold the ring to hold body and soul together until she convinced someone to hire a cook barely into her twenties. She lowered her hand to see another housekeeper was bearing down upon her like a hawk on a mouse. “References?” The word was a fox’s yip. Because she begged the cook in her father’s house to teach her on lonely days when she couldn’t spend her lonely hours riding..
“Why did you leave your previous employer?” the housekeeper interrupted her. And she had seen Major Reynard’s name on the guest list for an upcoming houseparty. The Featherstones had been kind to her. She didn’t wish to embarrass them with her true identity emerging while guests from the haut-ton filled their house. “As you see from my references, my work was more than satisfactory. I, um—“ She forgot what she intended to say, for she spied the major striding toward her through the crowd without his housekeeper this time. I’m good.” She finished with a lameness that would convince no one to hire her. But the housekeeper was reading her references with care. “I don’t. I mean, I didn’t. That is to say. . .” Arabella’s voice trailed off as the potential employer thrust the letters back. “You look too young.” She trundled off to a stout woman with a dented tin pot. “You don’t need to be working like a common servant now that I have finally located you.” He reached for her arm. A circle of silent onlookers surrounded them. She tucked pot, spoon, and the bag with her measly belongings behind her back. “The time for talking to me was three years ago. But, you couldn’t flee fast enough from so much as a fare-the-well.” Tears stung her eyes, clogged her throat, and she stepped backward before he noticed. And stepped on someone’s foot. “Yow, ye broke me toe.” The cry sounded more like the yowl of a cat defending its territory than a young woman. The blow she dealt Arabella on the side of her head with the handle of a broom felt more like a truncheon. She gasped and staggered. Her pot flew in one direction, her spoon in another. The pot knocked the brushes from the hand of a chimney sweep, and a stray dog snatched up the spoon and darted through the crowd as though he had captured a meaty bone. “My spoon. My pot.” Arabella shrieked her dismay. “I need them. I—“ She yanked free and darted after the sweep with her pot. She couldn’t afford a new one. She wouldn’t have that one if she hadn’t slipped it out of the house ahead of the bailiffs come to collect all the Barrs’ worldly possessions. But the sweep was small as his kind was wont to be, and the fair crowded. He vanished from her sight before she ran a dozen yards. And she had just lost her reticule. One cord of her bag still dangled over her sleeve from where a cutpurse had taken advantage of the chaos and run off with the last of her worldly wealth—two shillings and a happens. She stared at the frayed string and wished the maid had wielded the broom a little harder. If she had been knocked unconscious, she could wake up to discover this was all a nightmare. But she was already awake and this was not a nightmare. Stark reality told her she was now bereft of the tools of her trade, her references, and a paltry sum of money, but enough for a pie. How she would adore a pie. Though the crust would likely be tough and greasy, not her own flaky pastry light enough to blow away with a puff of air, sustenance of any kind would help ease the gnawing emptiness inside her, an emptiness caused by a lack of nourishment for the past two days, and a hollow place in her chest once filled by her love for a dashing cavalry officer. That cavalry officer reached her side and simply held out his elbow for her to take as though they promenaded through a garden party at a country house and not through a malodorous throng. He wore the buckskin breeches and top boots of the country gentleman rather than his uniform, and yet he was no less dashing. Chiseled features, broad shoulders, and narrow hips did that for a man when he was also confident to the point of arrogance, expecting all to move from his path and do his bidding despite his position of the third son of a modestly prosperous baronet. She gave it to him. That was easier than arguing. He took it with the tensed muscles of someone who expected a heavy burden. At the lightness of the bag, little more than a drawstring sack like an over-sized reticule, he took half a minute to gaze down at her, his dark blue eyes registering an expression she chose to believe was pity. “I expected more,” he said. “But why—“ He shook his head and resumed walking, his stride long, his footfalls striking the ground hard enough for her to feel them through his arm. “Arabella, please don’t.” He didn’t say what he didn’t want from her—as if he hadn’t said that loudly and clearly three years earlier—for the reached the inn. The tap and coffeerooms bulged with sweating, shouting humanity on either side of the entryway. The Major shouldered his way through the swarm and up a flight of steps to a room at the top of the steps. He knocked and the housekeeper opened the portal to show a plainly furnished room with a table and chairs, a sideboard and desk, an oasis in the desert. She showed Arabella to an adjoining room. Warm water and soap, though harsh, restored some of her dignity. A comb for her tumbled hair helped even more. The smell of meat pies and other savory dishes brought into the parlor by an inn servant nearly restored her to a shred of the confidence that had gotten her out of London and into a paying position before she starved to death. Then she strolled into the parlor and faced Major Gareth Reynard in enough quiet and privacy for them to speak for the first time since he slipped out of her life. The fragrance of the meal gagged her. Her knees grew so weak she clutched the back of a chair to stop herself from dropping to her knees on the floorboards. Only her pride gave her the strength to look the major in the eyes. Part 2 of Love Everlasting can be read here. So what do you think? Is any excuse good enough to explain the major jilting his fiancee practically at the altar? Regardless, how can Arabella forgive him? Could you forgive a man who left you at the altar in an hour of desperate need or any other time? Vegans, Vegetarians, and PETA look away from this post. As we get ready to celebrate the 4th of July, our nation’s Independence Day, we should take the time to thank a service man or veteran for their duty, for choosing to protect America so we might enjoy freedom and wonderfully barbequed hamburgers and hot dogs. The English during our period of the Regency were not particularly joyous of America’s Independence. They still brooded over their loss in our Revolutionary War and impressed our men into service to fight their other wars, but I digress. Yet, we can still trace our love of fire roasted meats to them. 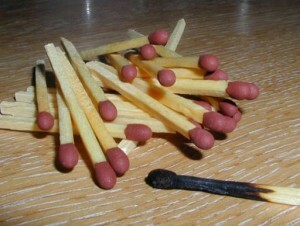 Fire roasting was (and is) common around the world and a forerunner to our barbecue cooking method. 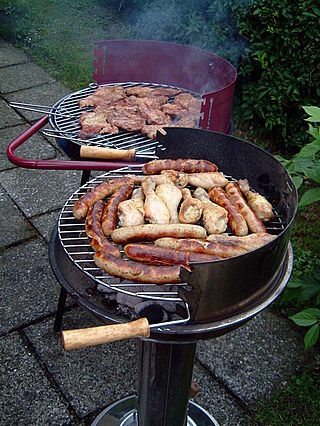 From cooking meat in a hot pit in the ground to using wooden frames to hold the meat, people of all cultures and all nations figured out fire-cooked meat was yummy. The English were quite serious and well regarded for their meat cooking. “Roast meat, Stek, is the Englishman’s delice and principal dish. It is not however always roasted, Stekt, to the same hardness as with us in Sweden. The English roasts, stekarne, are particularly remarkable for two things. All English meat, whether it is of Ox, Calf, Sheep, or Swine, has a fatness and a delicious taste,either because of the excellent pasture, betet, which consist of such nourishing and sweet-scented kinds of hay as there are in this country, where the cultivation of meadows has been brought to such high perfection, or some way of fattening the cattle known to the butchers alone, or, for some other reason. We can thank John Walker, an English chemist who in 1826 invented the friction match. He took a stick of wood and dipped it in a paste formed from potassium chlorate and sulfur to make a match that lit when struck on an abrasive surface. As you light up the coals tomorrow, think John Walker, unless you own one of those fancy auto-lighting-gas grills or a lighter. 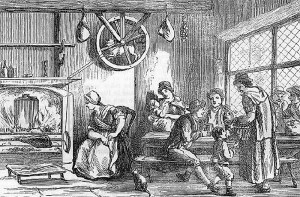 One thing I am glad did not become the norm is the Turnspit Dog. Look at the picture below and see the dog on the circular track pinned to the wall. No, your eyes are working properly. The doggie is hung up like kitchen pots or a ladle, just another kitchen utensil aiding the cooking of foods in an English kitchen. 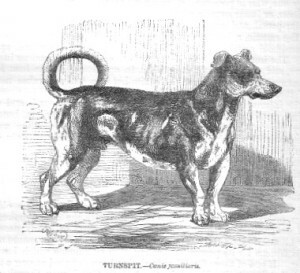 Turnspit dogs were short animals trained to run on a treadmill like cage so that spit meat cooked evenly. These kitchen helpers were small, low-bodied creatures with short front legs. They often had grey and white fur or reddish brown. The dogs, commonly called Kitchen dogs, Turnspit dogs or Vernepator Cur were very sturdy and capable of turning the spit wheel for hours. Now that is some serious cooking if you have to train pets to help. Lucky for us and the greater good, this practice died off by the late 1850’s. So light up those grills tomorrow, be thankful of our independence, and give a special patty to your pet pouch. Happy Fourth of July.